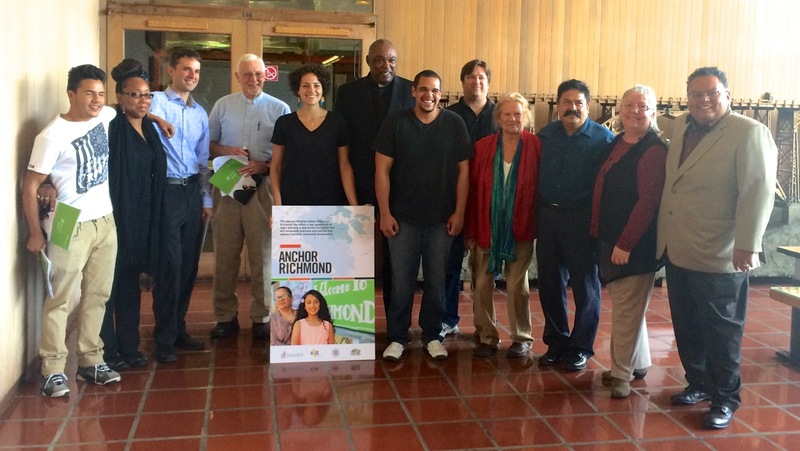 For the last year, I have been given the opportunity to work with community partners and residents in Richmond, Calif. to research potential impacts and opportunities on this city due to a planned development project to be built here by University of California, Berkeley over the next decade—the Berkeley Global Campus at Richmond Bay. Richmond has not seen a public project of this magnitude since the shipyards of World War II, and the potential for growth and success with this new campus could truly transform Richmond, both for better and for worse. Oct. 30, we held a press conference in Richmond, Calif to mark the release of a new report which details a range of strategies identified by the community that UC Berkeley can employ to create opportunity and ensure inclusiveness. 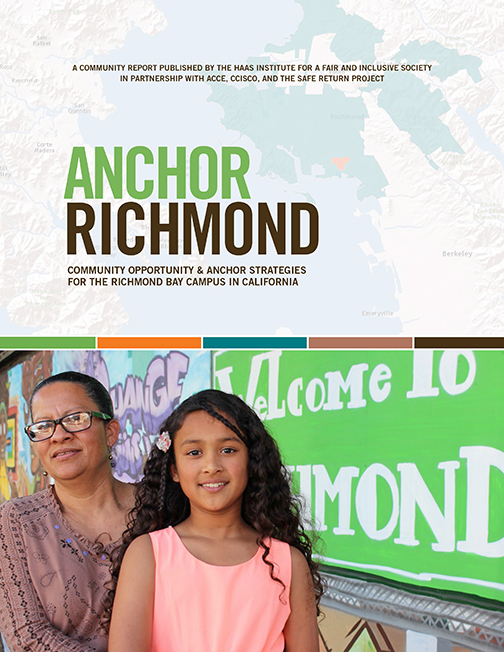 The report, entitled Anchor Richmond, is a product of over a year of organizing and research done in partnership with community-based organizations in Richmond, including the Contra Costa Interfaith Supporting Community Organization (CCISCO), the Alliance of Californians for Community Empowerment (ACCE), the Safe Return Project and hundreds of other community members from Richmond. The vibrancy of the Richmond community and its dedication to organizing for change have been awe-inspiring, to say the least. Our report is only a reflection of the community’s commitment to innovative organizing and policy change that Richmond is now famous for across the country. In attendance at the press conference were Richmond community leaders and members, locally elected officials, including Mayor Gayle McLaughlin and Vice Mayor Jovanka Beckles, local press and representatives from UC Berkeley. As Mayor McLaughlin highlighted in her remarks, Richmond has successfully reduced its crime rates dramatically in the last few years, installed more solar watts per capita than any city in California, and successfully challenged the power of Chevron, one of the largest corporations in the world. Given the city’s commitment to progress and innovation, UC Berkeley stands to gain tremendously from partnering with Richmond and could learn a great deal from its policies, strategies and organizing. As many of the community members said today, the Berkeley Global Campus is a historic opportunity for UC Berkeley to build and expand its research and educational capacity in such a way that also provides opportunities around education, jobs, small businesses and affordable housing for the Richmond community. The increasing levels of inequality in the region and trend of ongoing displacement of communities of color in the Bay Area are definite causes for concern within Richmond and beyond. UC Berkeley has the chance to create the ultimate model of fair, accessible and inclusive development, in a way that this country has rarely seen. As a public institution dedicated to integrity, diversity and opportunities for equitable access to learning and development, UC Berkeley has an obligation to uphold these values in its new project and make the campus an intrinsic part of the social fabric of Richmond so that everyone can benefit from its development. I am proud to have co-authored this report, and even more proud to have been given the opportunity to work with the community in Richmond. I hope that UC Berkeley can fully realize the potential for community partnership by implementing the strategies detailed in the report so that the campus becomes a hub not only for global partnership, but for community partnership too.